Tonight! Historical Society Benefit Reviewed by Edgeville Buzz on May 6, 2009 . 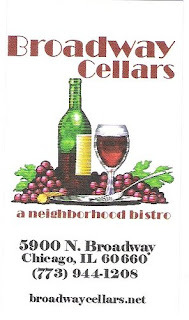 Broadway Cellars Bistro is the site of the Edgewater Historical Society’s spring fundraiser tonight, Wednesday, May 6, from 6 p.m. to 9 p.m. The cost of the evening, $40 in advance and $45 at the door, includes hors d’oeuvres, a dinner buffet, cash bar and silent auction. For more information, go to the Historical Society’s website.